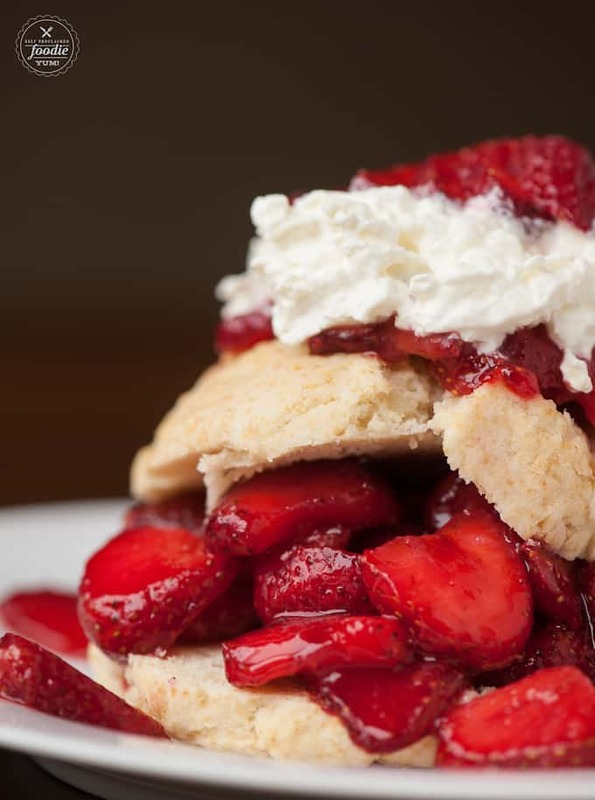 Classic Strawberry Shortcake, made with fresh strawberries, homemade biscuits, and whipped cream is the easiest and most perfect summer dessert! Combine strawberries, sugar, and lemon zest. Allow them to develop flavors in refrigerator for at least an hour, up to overnight. To make shortcake, preheat the oven to 400 degrees F. Sift together the flour, baking powder, baking soda, sugar, and salt in a medium bowl. Add heavy cream and mix until just combined. Mixture will be very thick. Form two large rounds for four small rounds on an ungreased pan (I used a cooking stone) and bake until golden, 15 to 20 minutes. For added crunch and sweetness, you can sprinkle large decorator's sugar on top of the biscuits, if you have some available, prior to baking. Allow to cool once removed from oven. To make the whipped cream, combine the heavy cream and sugar and beat with whisk attachment on high speed until soft peaks form, about 4-7 minutes. To assemble shortcake, split biscuit in half. Layer with strawberries in the middle and on top and then top with whipped cream. Enjoy! 0 Response to "CLASSIC STRAWBERRY SHORTCAKE"